Description: Frederick Dutcher was an early pharmacist in the northwestern town of Saint Albans, Vermont. There are several very sought after early medicines with Dutcher’s name including “Dutcher’s Dead Shot for Bed Bugs,” which can be found with a pontil base. This label only Dutcher’s is in good shape, small tear but all is quite readable. In case you were wondering (I was) Sweet Spirits Nitre is a pale yellow liquid, of a sweetish taste and a pleasant ethereal odor. It is obtained by the distillation of alcohol with nitric and sulphuric acids, and consists essentially of ethyl nitrite with a little acetic aldehyde. It is used as a diaphoretic, diuretic, antispasmodic, etc. Condition: Label is complete with a small tear. 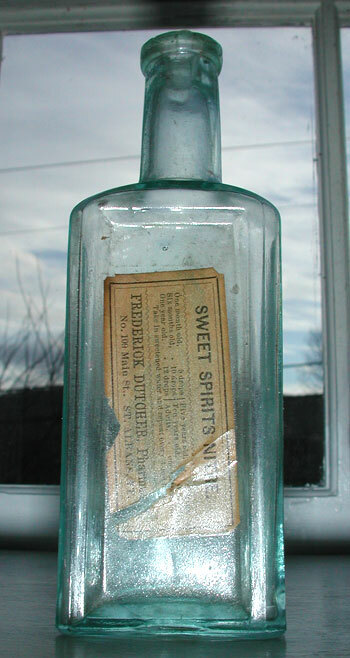 A clear coat spray was used to protect the labels condition.